Belgian authorities say at least one man is on the run a day after police arrested two suspected militants. The federal prosecutor said that an attack could not be ruled out if further suspects felt cornered. Anti-terror police are holding two brothers and found guns, ammunition and police uniforms during raids in Brussels. "We're still searching for various terror suspects after last night's raids," said Eric Van der Sypt. "We fear that they will feel driven into a corner after the raids. We're also afraid of the same reaction as the 22 March," the federal prosecutor told public broadcaster VTM. Thirty-two people died in bombings in March 2016 at Brussels airport and a city metro station. Mr Van der Sypt said there was no indication yet that a similar attack had been planned. No details were given of the suspects still on the run and Belgian officials said the terror alert would remain at three, the second highest level. Last month, a man set off a bomb at Brussels Central Station before being shot dead by soldiers. 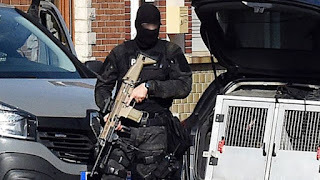 Three Kalashnikov assault rifles, ammunition, detonators and a riot gun were seized during police raids in the Anderlecht area of Brussels on Wednesday. Across the border in France, raids also took place in a suburb of the northern city of Lille and a man was detained. Police were also alarmed by the discovery of uniforms belonging to police and other security agencies. Police union president Vincent Gilles said the suspects may have been planning to attack the public or a police station.